GIRA Foodservice has been updating every 6 years a multi client market study about the structure of the Foodservice Market in Switzerland. The new version will be published in June 2014 and will give an overview of the Foodservice market in Switzerland based on 2013/2014 key facts & figures as well as historical series from 2007 to 2012 and future trends up to 2015 and 2020. 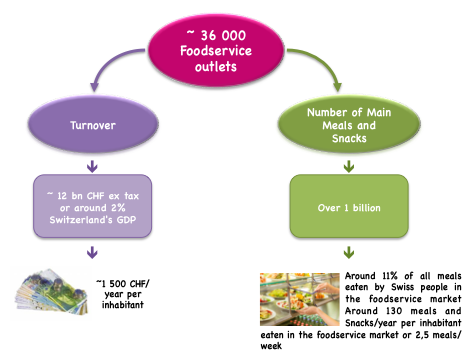 In 2012, the Swiss foodservice market represented a total value of around 2% of Switzerland's GDP and the service of over 1 billion meals and snacks. In terms of turnover, around 1 500 CHF were spent in 2012 on eating out of home per inhabitant. Over three quarters of the total value were generated by the commercial foodservice market. The meals which were consumed out of home represented around 11% of all meals eaten by Swiss people, i.e. around 130 meals and snacks per year per inhabitant, which gives another ratio of around 2,5 meals per week. Some key figures about food purchases in the foodservice market in Switzerland were also provided: the commercial foodservice sector was generating around 70% of the total amount of food purchases in the foodservice market. The improvement or not of the economic situation, of the employment market ? Activity of schools with full-day education in the German-speaking part of Switzerland ? Further reduction in the average length of stay in hospital ? Continuous ageing of the Swiss population, greater need for care for elderly people ? What about the climate of consumer confidence ? What are the successful foodservice concepts in which sectors ? Impact of sustainability within foodservice ?